Many students and pros rely on scientific calculators to get their calculations done faster. The problem with physical calculators is the fact that they are limited in many ways (no matter how much money you spend on one). Thanks to calculator apps for iPad, you won’t have to rely on a physical calculator to measure and convert things. Weather Calculators and Converters is a specialized calculator that offers conversions and functions for those who have to deal with weather-related problems. As the name suggests, Weather Calculators and Converters provides users with multiple tools. 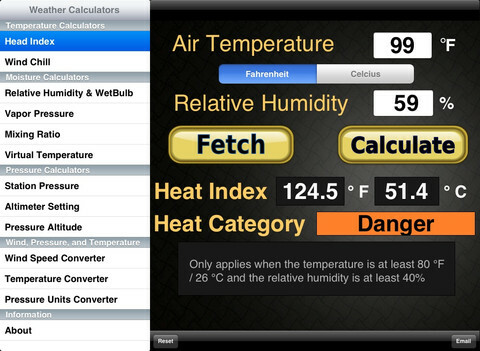 You can not only use this app to convert among various units, you can also calculate weather related numbers. 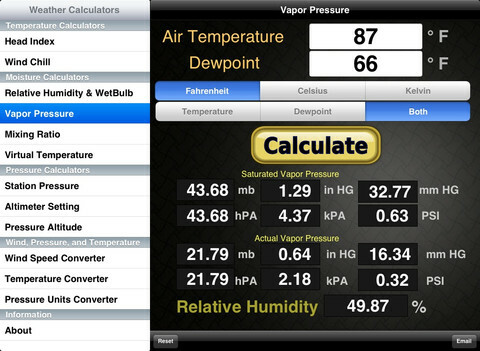 Weather Calculators and Converters handles wind chill, heat index, vapor pressure, altitude, and a whole lot more. It also lets you convert temperature, wind speed, and pressure units. Weather Calculators and Converters is a collection of fairly simple tools but can save weather students time doing their calculations. Once done with your results, you can email them to others. The app works on iPhone too. This is a fairly affordable weather calculator but does what it promises well.